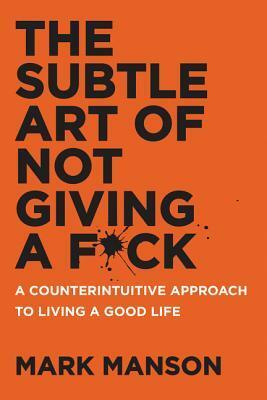 The Subtle Art of Not Giving a F*ck: A Counterintuitive Approach to Living a Good Life. Mark Manson. Nonfiction/Self-help. 2016. 224 pages. 4.5 stars. Don’t just sit there. Do something. The answers will follow. I have seen copies of this book in nearly every bookstore since its release. It also received good reviews despite its radical title and content. My curiosity won when I bought myself a copy a few months ago and read it. Safe to say, this book is unlike any other self-help book I’ve come across (not that I’ve come across a lot, but we can overlook that tiny detail). To start off, a lot of Mark Manson’s content generally has the same theme: stop caring so much. Many chapters focus on mankind’s tendency to overanalyze and strictly follow a life plan created by every individual. This book tells you that it’s okay if things don’t go according to plan, it’s okay not to even have a plan, and it’s okay if you fall short one too many times. Because that’s what life is about! You learn best from your mistakes. However, I’d like to point out the subtle praise of mediocrity in this book, which may come across as praising the Bare Minimum™ everyone is so obsessed with today. If anything, the ambivalent stance Manson has on the bare minimum and settling for being mediocre is my only issue with this book. I would be exaggerating if I said that this book changed my life, but it definitely changed the way I see life and how I would go about with my lifestyle, world views, and mindsets. If you haven’t read this, I advice that you pick it up and give it a read! 4.5 stars.